This blog post was sponsored by Stonefire Naan, but the opinions are all my own. This is the time of year that seems to slip through my fingers. Before you can even say "fall," school starts back up, humidity gives way to crisp air and local farm stands push the last of summer's bounty before pumpkins make their seasonal debut. Perhaps more than any other time of year, now is the best time to take advantage of fresh vegetables. 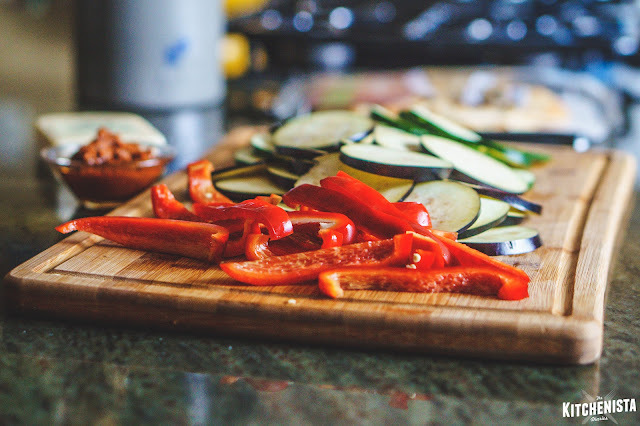 Most farmer's markets and grocery stores are overstocked with eggplant, bell peppers, zucchini, onions, and tomatoes, at the lowest prices you're likely to ever see. The first thing that always comes to mind to celebrate this fleeting moment is ratatouille! 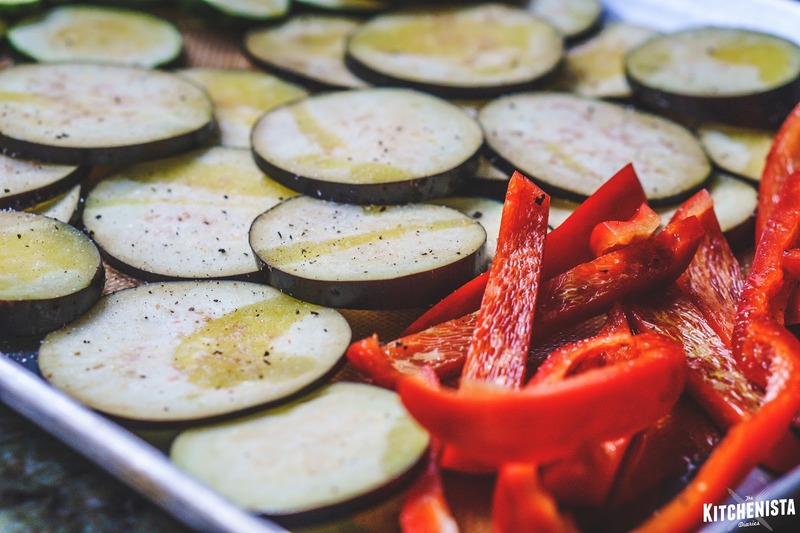 Ratatouille is one of my favorite ways to prepare veggies when I want them to be the star. It's a tedious process of cooking the onions, peppers, zucchini, eggplants and tomato all separately before combining them for a slow roast in the oven, but out comes a miraculous pot of vegetables that are somehow more than the sum of their parts. Despite my best efforts (read: wishful thinking) to spend fall Saturdays coaxing slow cooked magic out of my Dutch oven pot, sometimes there just aren't enough hours in the day. 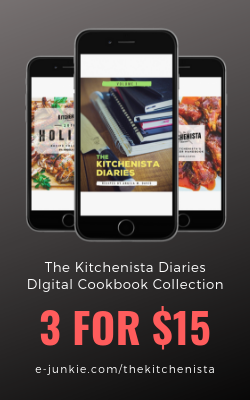 I'm working a full time job these days, so the weekends have become a mad dash to photograph dishes for my current ebook projects, price upcoming catering gigs and keep up with my blog. Now throw in a football playing 8th grader and a sassy toddler determined to resist both weaning and potty training for the rest of her childhood. We're just a little bit overwhelmed over here! No worries though. This is all part of the deal when fall rolls around, as most busy moms know. Come October, we'll have our new schedules figured out and it'll be smooth sailing, at least until the holidays! In the meantime, I've had to get a little creative with weekend meals that still satisfy my seasonal cravings. 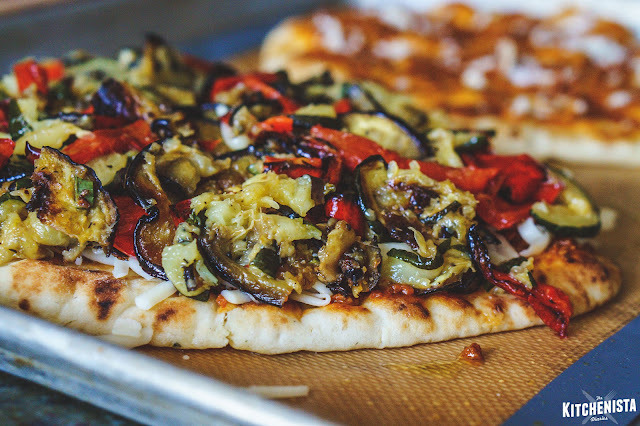 It was perfect timing to hear back from Stonefire Naan, who loved my open-faced breakfast sandwich and asked me to collaborate on a new fall recipe. 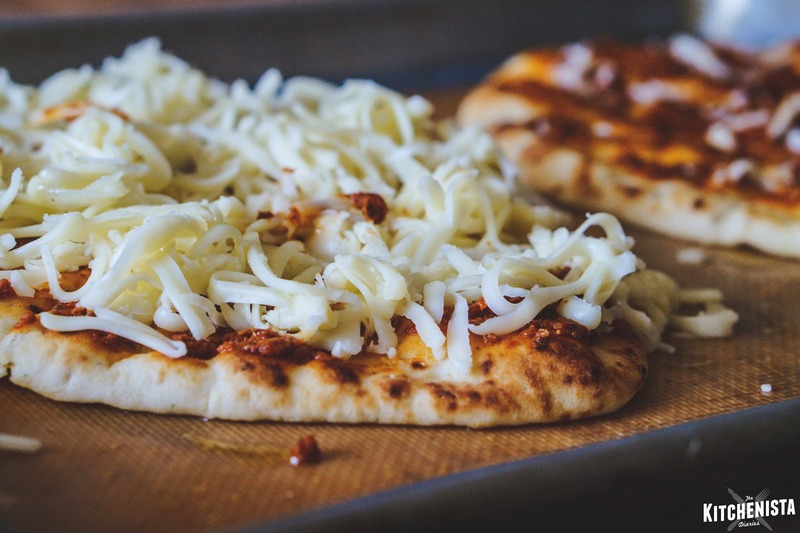 I'm thrilled to once again say #HelloNaan and welcome Stonefire® Authentic Flatbreads into my kitchen! 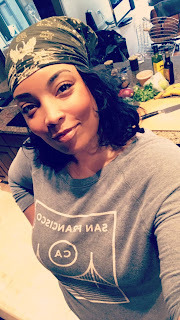 With my kitchen counters already overflowing with veggies from my last farmer's market trip, I headed out to our local Giant store to pick up the naan and brainstorm a fall inspired idea. Stonefire Naan comes in a variety of sizes and flavors so the possibilities are endless. I picked up a package of the garlic flavor and original and figured I'd make a decision once I got home. 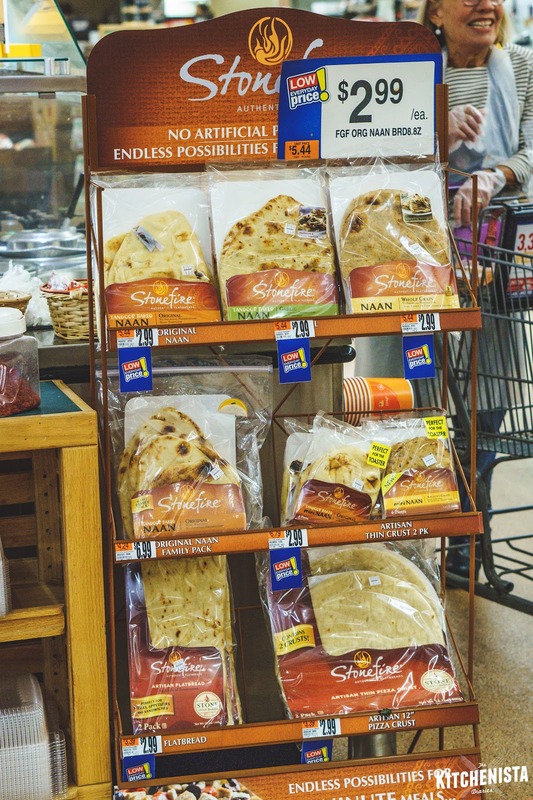 (Stonefire's naan is sold fresh, so keep it in the freezer if you won't be using it by the date stamped on the package!) The Stonefire store display was right next to the cheese case, which gave me my "aha" moment. I love roasted veggie sandwiches and who doesn't love grilled cheese? 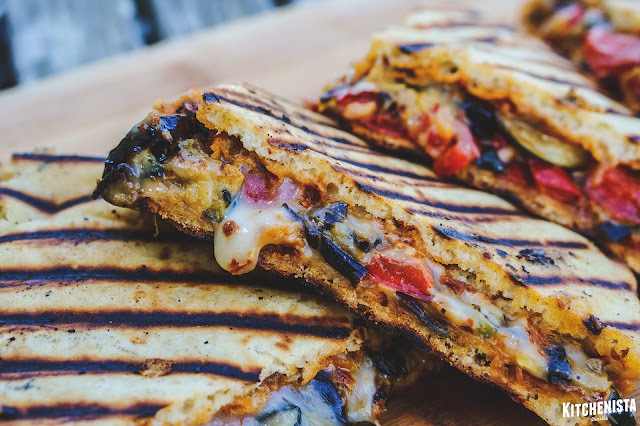 Ratatouille grilled cheese it would be! Don't fret, this doesn't require that you prepare a true ratatouille. Although if you're lucky enough to have leftovers you could certainly use that instead. 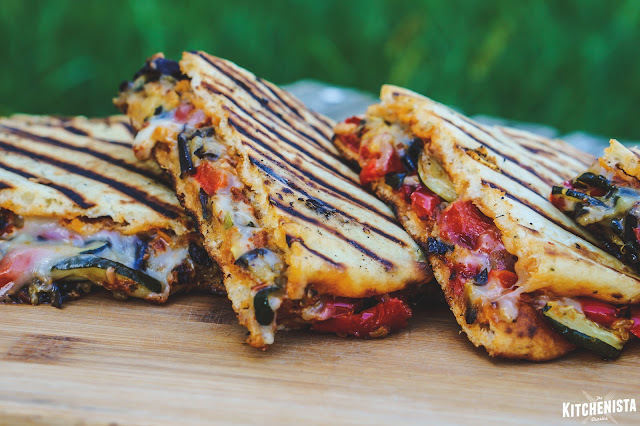 For my naan grilled cheese, it was much easier to simply roast a sheet pan of veggies, keeping in theme with eggplant, peppers and zucchini. I picked up a jar of sun-dried tomato pesto to make up for the sauce and opted to use the garlic flavor naan for a boost of flavor. It turned out to be the next best thing and provided some much needed comfort food on a busy fall weekend! 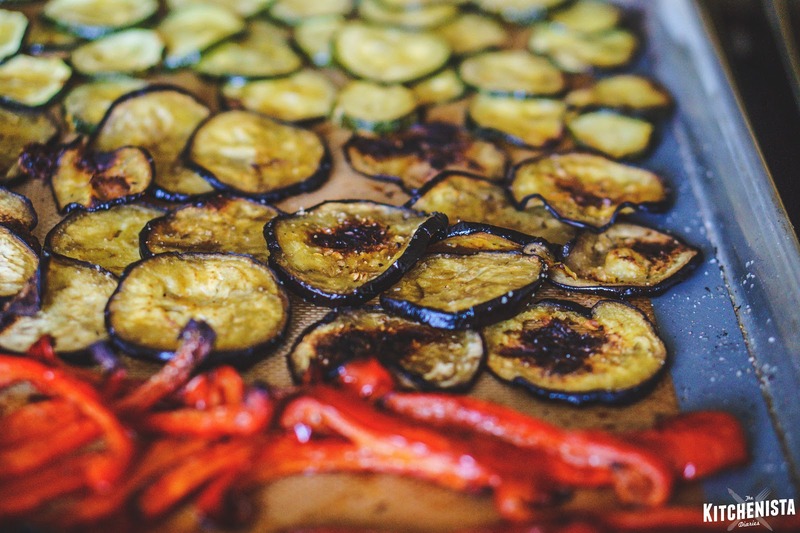 Preheat your oven to 400° F. Slice the eggplant and zucchini into 1/4" rounds. Slice the bell pepper into 1/2" strips, discarding the core. Arrange all of the veggies on a lined sheet pan and drizzle generously with olive oil. Season with salt and pepper. Roast the vegetables for 15 to 20 minutes, or until they're beginning to crisp and brown on one side. Flip them all over, drizzling with additional oil if needed. 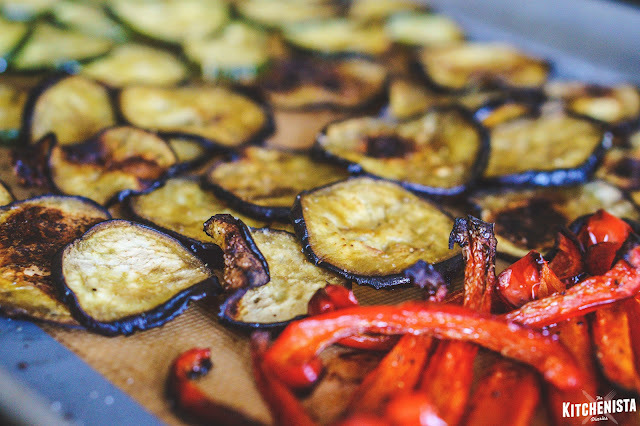 Continue roasting another 15 minutes or until the eggplant and zucchini is golden brown and crisp around the edges and the peppers are charred. 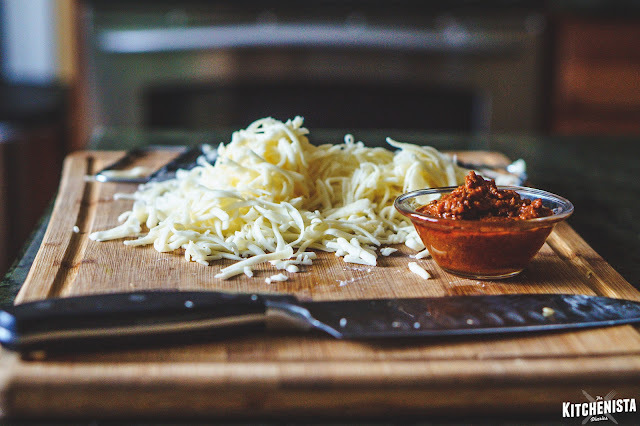 While the veggies are roasting, shred your cheese. Fontina worked great here and let the veggies shine. Another mild, melting cheese will also work, such as whole milk mozzarella. Preheat your cast iron grill pan or skillet. 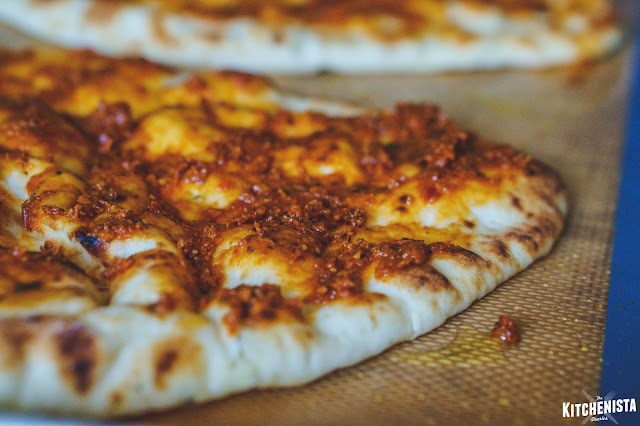 Spread the tops of each garlic naan with tomato pesto. ...followed by all of those roasted veggies. 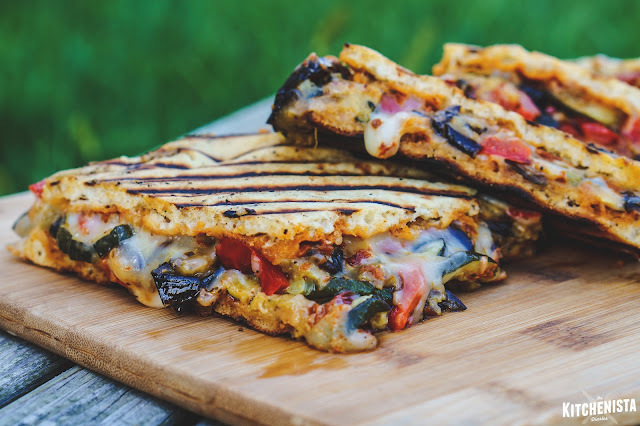 It's always amazing how a whole pan of veggies wilts down to what can fit between a sandwich! Finally, add the rest of the cheese. Press the remaining naan over the top, pesto side down. Lightly oil your grill pan, then carefully transfer the sandwich onto the pan. It's helpful to use two spatulas, one underneath each side. After a couple minutes, carefully flip the sandwich over to grill the other side for another minute or so until the cheese has melted. As much as you'll want to devour this right away, let it cool for a minute or so until it's safe to handle! Slice into quarters and serve warm! 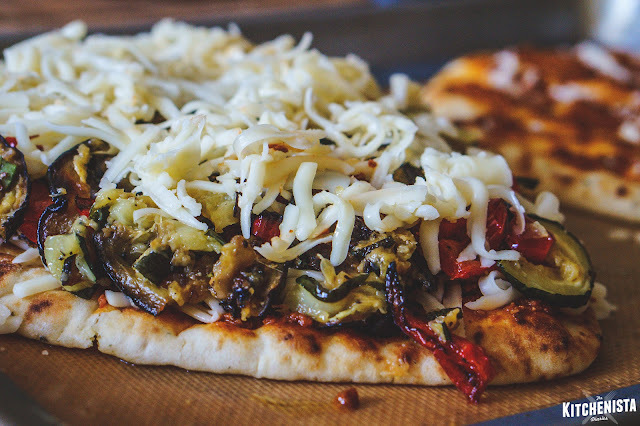 The smoky, crispy grilled garlic naan is to die for with melted cheese and tender roasted veggies. 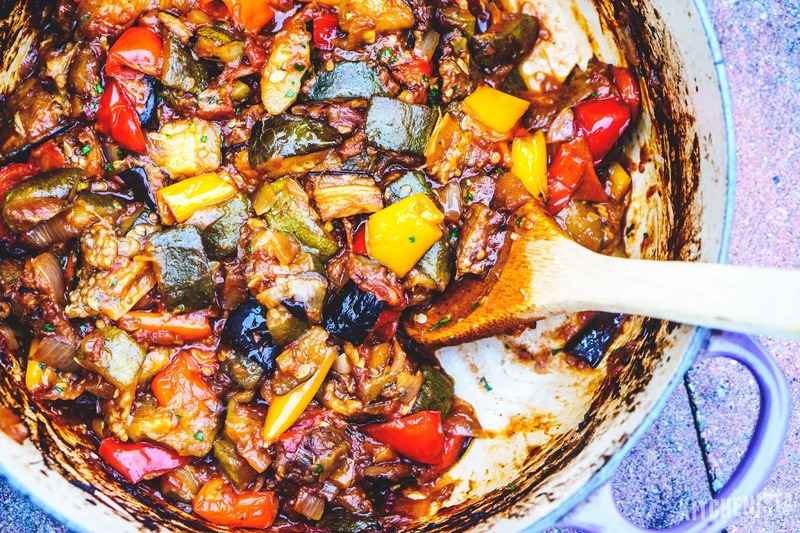 It was seriously the next best thing to a big pot of traditional ratatouille... although that is still on my list as soon as things slow down around here! 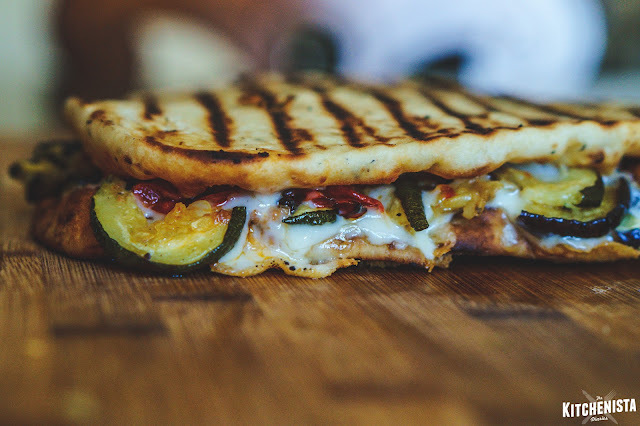 I made this sandwich two days ago and it was so good. I couldn't eat the whole thing, though, so I cut the second half in half and stored both in the refridgerator. I just reheated one in my toaster oven and it may taste even better. 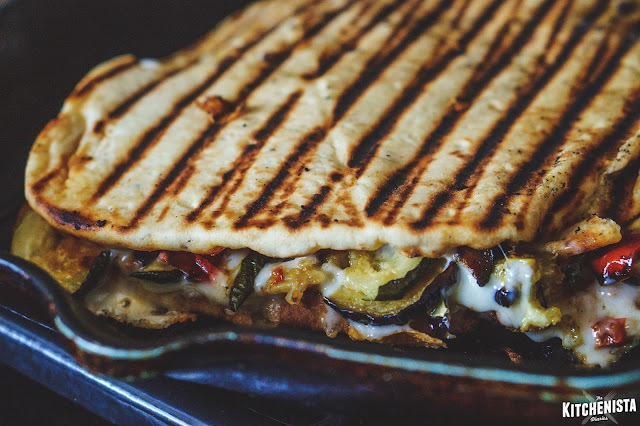 So don't be afraid to make this big sandwich for one person - it reheats beautifully. I also saved a quarter of mine for breakfast the next day, reheated beautifully. Thanks so much for trying it and glad you enjoyed!